If you are printing two labels consecutively that are different sizes use the procedures below. 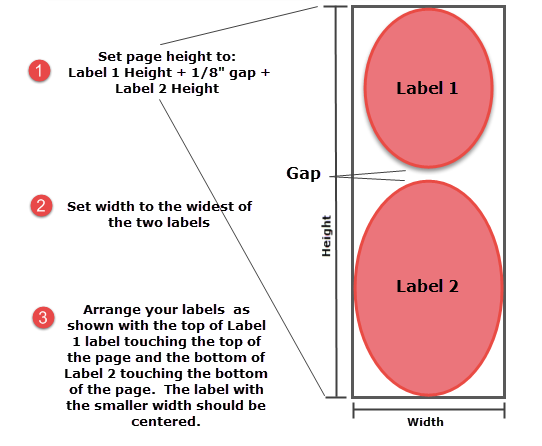 If you are printing two labels that do not meet the minimum height requirement of 0.75" you may use the procedure below to combine two of the same labels together into a single label file that will meet the minimum height requirement when you add them together. To print the label you will need to setup one single label that contains the image for both label one and label two. Because the entire label is the size of two labels the printer will ignore the gap between every other label. Note 1. Custom label stock is required for multiple page printing of different sized labels. Note 2. If the labels are different sizes you will need to make sure that your start position is correct, meaning that Label 1 is in the immediate print area before printing. If the start position is incorrect, press the Load/Feed button to feed one label.